CALL OUR SNO-PHONE: (802)-447-SNOW (7669) – CONDITIONS UPDATED DAILY! Scholarship entry deadline is fast approaching. The application has been updated and is available online! Click here to download. Stay up to date with the latest Club info & Trail Conditions! The Woodford SnoBusters would like to thank Bill Garrison from the Green Mountain National Forest for his dedication, stewardship, and career long commitment to maintaining and improving access to our Forest We all wish Bill the best in the next chapter of his life! 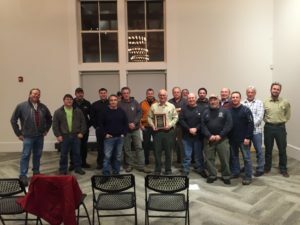 Several members of the SnoBusters presented Bill with a plaque, thanking him for his service and wishing him well in his retirement, recently at a Green Mountain National Forest Meeting.